Your smile can change your entire appearance, dark teeth can make us feel self-conscious and may affect our personal and professional life. Some of the treatment options at Kissing Point Dental for discoloured teeth are. 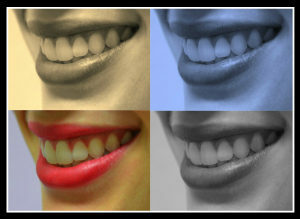 Teeth Whitening can be a fantastic cost effective option for enhancing your smile. Teeth Whitening can be a fantastic cost effective option for enhancing your smile. Whiteners may not correct all types of discoloration. For example, yellowish hued teeth will probably bleach well, brownish-coloured teeth may bleach less well, and grayish-hued teeth may not bleach well at all. Likewise, bleaching may not enhance your smile if you have had bonding or tooth-coloured fillings placed in your front teeth. The whitener will not affect the colour of these materials, and they will stand out in your newly whitened smile. In these cases, you may want to investigate other options, like porcelain veneers or dental bonding. After making moulds of your teeth, plaster models are poured. Customised vacuum trays are then fabricated and shaped to fit your teeth snugly. The bleaching solution is then placed inside the trays which are then fitted to the teeth. Porcelain veneers have successfully improved smiles by making dark teeth look lighter and healthier looking. They can make yellow teeth permanently whiter and gray tetracycline stained teeth look much more natural. Porcelain veneers can make crooked teeth look straight in just a few days. Patients can look and feel more confident, more professional and have a wonderfully natural looking smile. You do not have to have your natural teeth ground down, as porcelain veneers can be totally non invasive without requiring shots. Just like porcelain veneers, Composite veneers can be used to disguise dark or crooked teeth. They can be made in one appointment but unlike porcelain veneers they only last 4 to 8 years and do require regular maintenance as they don’t have the strength of porcelain veneers and stain very easily.